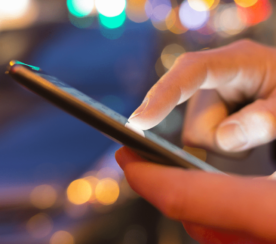 Retargeting is an advertising technique that aims to convert browsers into buyers by increasing the number of times they see a campaign’s ads in a set period of time. The catch is that you’d normally need fancy technology to do this. In response to this problem, I came up with poor man’s retargeting for low-budget advertisers. The idea was to look at shared traffic by means of link analysis and run ads on sites that were heavily interlinked. Today, I’d like to take that a step further and look at three tools and how they might be applied to improving your online ad spend. First up is the tool that will get you closest to what I was suggesting: a web spider. I’ve personally used the demo spider offered by New Pro Soft. The way it works is that you specify what data you want from a wizard-style series of options, and then it will get it for you. The specific options you would use for this are to crawl 1 level deep and specifically crawl external links. The result will be a data set that shows you who the external links are going to and then who their external links are going to (counting in this case starts at 0, so external links on the site you specify are 0, then level 1 is the next batch). You can get an idea of where the links are going through this. If you crawl deeper you can see the ‘web’ of links better and this should help you target your ad spend. Of course, you don’t need to use that spider. A search on Google for web spider or web crawler or web robot (or on reputable software download sites where you won’t get spyware/adware/trojans etc.) can find you others that will do the same. Second, for a mere $500/month, Compete will serve you up with the info on who is driving traffic to competitors. 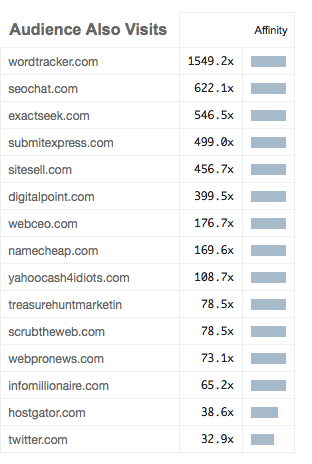 In short, Compete gives you the ‘top referring domains’ report, ordered by traffic. 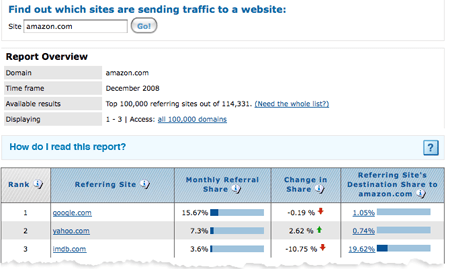 It also shows the percentage of a site’s outgoing traffic Amazingly, Amazon.com apparently accounts for 1% of Google’s outbound traffic! That means that 1 in 100 searches result in a visit to Amazon. Jeff Bezos truly is the King of SEO. Of course, Compete’s data is far from perfect, but I’ll get into that another time. For now, it suffices to share this screenshot to illustrate. 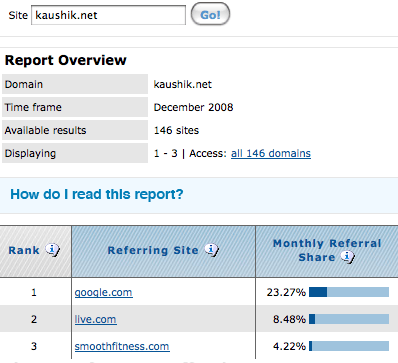 Supposedly Avinash’s web analytics blog gets a bunch of traffic from a treadmill retailer. I’m sceptical. Nevertheless, with 2M panel users and a number of other data points, I think it’s a valuable data source if you use it for relative comparisons, rather than specific numbers. Yes, I was being sensationalist with that Amazon tidbit, but only slightly. It still indicates that Amazon is ridiculously well SEOed. On a related note, this tool can be helpful in recruiting affiliates. Notice how Amazon’s third top referrer is the IMDB? For the time being though, with minimum ad buys on some retargeting networks starting at just $200, you can get the full tech shebang plus your actual ad impressions cheaper than Compete’s data. 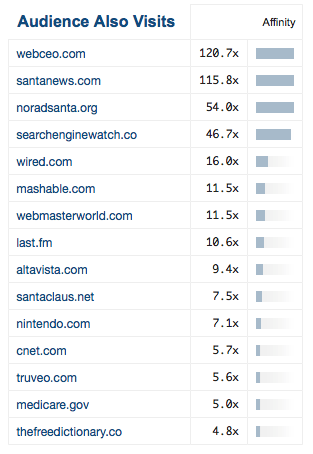 Third, Quantcast.com removes you even further from the data, but gets to the info we really want. (This is kinda like making a good analytics dashboard for your executives to take action on.) The info we care about is what other sites do this site’s visitors visit? Quantcast works by having publishers install their code on their site, and then tracking the reach. They then do some fancy mathematical mumbo jumbo and figure out demographics etc. So anyways, here are three reports that Quantcast offers, free, to help folks out with their targeting. First is “Audience also visits,” which is pretty self-explanatory except for the affinity metric. I have no clue what that means. 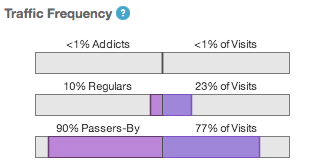 Second is “Traffic Frequency,” which other analytics platforms sometimes call loyalty. 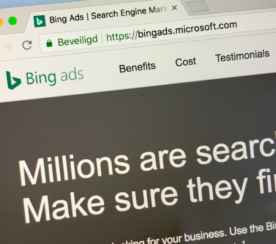 This is more useful for determining what impact your ads will have – branding campaigns benefit from more loyal audiences, but direct response campaigns do well with drive-by search traffic, often enough. That’s why PPC content pros scrape top search results and check them for adsense blocks, so that they can get cheap search traffic. Third, more distantly related is topics that also interest your audience. 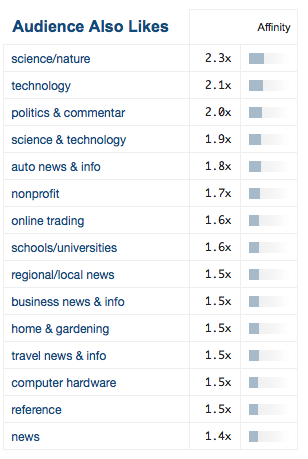 This is helpful for finding cheap ad inventory, as where an audience really cares about political sites, for example. Political sites typically monetize poorly, since they’re selling ideas rather than products (Cafepress tshirts/Amazon book links don’t count as effective monetization, sorry). To conclude, I think that with time, we’ll see greater precision in these tools as well as more meaningful metrics (@Quantcast What’s “affinity”? @Self: How do you tell whether a link is getting clicked from the spider outbound links report?) and thus greater efficiency with the media buys. As well, I wouldn’t be surprised to see some mergers and acquisitions as folks who can use the data more profitably (superaffiliates and affiliate networks, mega ad agencies etc.) get more closely involved. I’m trying to rank for “SEO” and SEO blog – speaking of which, swing by and check out my posts!